Now is a great time to find out where the wild plums are located! Look for their blossoms, or new leaves. They are one of the first trees to leaf out in the spring here in Central Texas and they have gorgeous white blossoms (that appear before the leaves!) 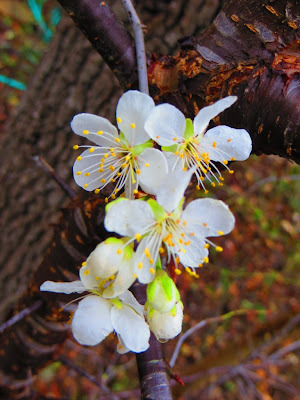 We have a few wild plum trees behind our guest house and two are flowering right now; one has already leafed out. Keep an eye on these trees and watch for ripe plums towards the end of the summer! Wild plums can be very tart but make really great jams, pies and sauces.